A few years ago, we had a long weekend in the vastly under-rated Belgian capital of Brussels, famous for beer, waffles, a statue of a little boy having a wee and mussels. I ate mussels three nights out of four, and on the other night I had a lobster, which came with a starter of mussels anyway, so really four nights out of four. Aside from the statue and the waffles (both over-rated), we had an excellent weekend. Brussels is a surprisingly vibrant place, with some great cafes and bars. Everything they say about Belgian beer is true, and it’s magnificence is only amplified by drinking it outside on a warm night, watching people go by. Back to the food. Mussels. Tricky little devils. Delicious, but could cause you untold harm if handled improperly. Mistreat a mussel and it’ll mistreat you. Cleaning mussels might be tedious, but they’re cheap and the cooking is quick and easy. Start by frying a finely chopped onion in olive oil in a very large pan. Add a diced carrot and a couple of stalks of diced celery. A few cloves of roughly chopped garlic add a depth of flavour too. Season well. Fry the vegetables until they start to take on colour, then add a few bay leaves and all of the mussels, quickly followed by a generous glass of dry white wine. Put a lid on the pan and bring to the boil as quickly as possible, then turn the heat down a little and let the mussels steam in the wine for about five minutes. The mussels will have opened up like flowers, each shell revealing a golden nugget of flesh. Some won’t have opened. Don’t eat them (they’ll kill you). Stir in a couple of tablespoons of cream or creme fraich to finish the sauce, add a very large handful of chopped flat leaved parsley, then serve straight away. There are other ways. Steaming in beer is excellent, as is using a tomato based sauce, but for me, moules mariniere is the best way. 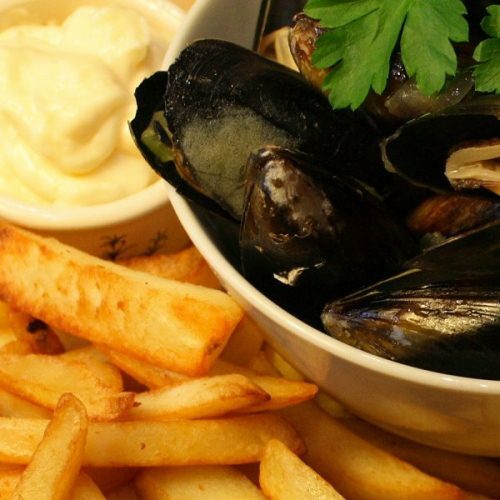 The only appropriate accompaniment for mussels are chips and mayonnaise. Maybe a baguette, but nothing else. Eating mussels is always a messy business. The best way to eat mussels is to use an empty shell as a makeshift pincer to pinch the flesh out. It’s easier than using a fork, and makes you look like an expert.